Mallory Burdette is done, Dmitry Tursunov is recovering, and John Millman is OK.
Burdette, a 23-year-old former Stanford star from Jackson, Ga., recently announced her retirement after only one year as a professional because of shoulder problems. The 5-foot-10 (1.77-meter) right-hander underwent surgery on her right shoulder last November and completed her bachelor's degree in psychology during her layoff. "As my tennis career comes to an end, only now am I able to fully appreciate the beauty of the journey," Burdette wrote on her Facebook page. "I couldn't be more proud of what I've accomplished, and, at the same time, excited to see what the future holds in the next chapter of my life." Burdette reached the third round of the 2012 U.S. Open (losing to Maria Sharapova) and at Indian Wells and Charleston in early 2013. She climbed to a career-high No. 68 that June. Burdette and her older sisters, Erin and Lindsay, combined to win four NCAA doubles titles while at Stanford. Erin triumphed in 2005 (with Alice Barnes), Lindsay in 2010 (with Hilary Barte), and Mallory in 2011 (with Barte) and 2012 (with Nicole Gibbs). Tursunov, a Moscow native who has a residence in the Sacramento suburb of Folsom, has played only one tournament since Wimbledon because of a left ankle problem related to plantar fasciitis. He lost to Alejandro Gonzalez of Colombia 6-4, 6-4, 7-5 in the first round of the U.S. Open. Tursunov, who will turn 32 on Dec. 12, wrote in an e-mail today that he hopes to return to the circuit in January but isn't sure if he'll be ready. Ranked a career-high No. 20 in 2006, the often-injured Tursunov has tumbled to No. 110. Millman, a 25-year-old Australian, withdrew from the recent Toyota (Japan) Challenger for precautionary reasons after winning the Traralgon (Australia) and Yokohama (Japan) Challengers in the previous two weeks. The 6-foot (1.83-meter) right-hander returned to the circuit in April after undergoing surgery in July 2013 for a torn labrum (cartilage) in his right shoulder. On the three-week Northern California Challenger swing this fall, Millman reached the quarterfinals in Napa, semifinals in Sacramento and final in Tiburon. In only five months, Millman has skyrocketed from No. 1,193 to No. 159, near his career high of No. 126 in April 2013. Collin Altamirano, 18-year-old Sacramentan -- No. 739 in singles (-4), No. 868 in doubles (-1). Mackenzie McDonald, 19-year-old Piedmont resident -- No. 631 in singles (+1), No. 588 in doubles (-7). Dennis Novikov, 21-year-old San Jose resident -- No. 370 in singles (-3), No. 466 in doubles (-2). Matt Seeberger, 30-year-old Los Altos resident -- No. 458 in doubles (-5). Dmitry Tursunov, 31-year-old resident of Folsom in Sacramento area -- No. 110 in singles (-1), No. 180 in doubles (-3). Kristie Ahn, 22-year-old former Stanford star -- No. 650 in singles (-2), No. 711 in doubles (+6). CiCi Bellis, 15-year-old resident of Atherton in San Francisco Bay Area -- No. 262 in singles (-7), No. 827 in doubles (no change). Hadley Berg, 18-year-old resident of Greenbrae in San Francisco Bay Area -- No. 949 in doubles (-2). Alexandra Facey, 21-year-old resident of Cameron Park in Sacramento area -- No. 738 in doubles (no change). Kat Facey, 21-year-old resident of Cameron Park in Sacramento area -- No. 738 in doubles (no change). Nicole Gibbs, 21-year-old former Stanford star -- No. 95 in singles (-1), No. 839 in doubles (-2). Michaela Gordon, 15-year-old resident of Saratoga in San Francisco Bay Area -- No. 700 in singles (-2). Lejla Hodzic, 28-year-old former Stanford standout -- No. 730 in doubles (+1). Raquel Kops-Jones, 31-year-old San Jose resident and former Cal star -- No. 12 in doubles (no change), No. 808 in singles (+5). Maria Sanchez, 24-year-old Modesto product -- Career-high No. 79 in doubles (+1), No. 242 in singles (-1). Karina Vyrlan, 16-year-old Sacramentan -- No. 766 in singles (+7). Allie Will, 23-year-old native of San Mateo in San Francisco Bay Area -- No. 160 in doubles (+1), No. 540 in singles (+6). Carol Zhao, 19-year-old Stanford sophomore -- No. 296 in singles (no change), No. 516 in doubles (+2). Collin Altamirano, 18-year-old Sacramentan -- No. 735 in singles (-3), No. 867 in doubles (-2). Bradley Klahn, 24-year-old former Stanford star -- No. 148 in singles (-12), No. 152 in doubles (+2). Mackenzie McDonald, 19-year-old Piedmont resident -- No. 632 in singles (no change), No. 581 in doubles (-1). Dennis Novikov, 21-year-old San Jose resident -- No. 367 in singles (-1), No. 464 in doubles (-3). Sam Querrey, 27-year-old San Francisco native and former Sacramento Capital in World TeamTennis (2012-13) -- No. 35 in singles (-1), No. 64 in doubles (no change). Matt Seeberger, 30-year-old Los Altos resident -- Career-high No. 453 in doubles (+49). Dmitry Tursunov, 31-year-old resident of Folsom in Sacramento area -- No. 109 in singles (no change), No. 177 in doubles (-2). Kristie Ahn, 22-year-old former Stanford star -- No. 648 in singles (+1), No. 717 in doubles (-3). CiCi Bellis, 15-year-old resident of Atherton in San Francisco Bay Area -- Career-high No. 255 in singles (+2), No. 827 in doubles (-4). Hadley Berg, 18-year-old resident of Greenbrae in San Francisco Bay Area -- No. 947 in doubles (+1). Alexandra Facey, 21-year-old resident of Cameron Park in Sacramento area -- No. 738 in doubles (-3). Kat Facey, 21-year-old resident of Cameron Park in Sacramento area -- No. 738 in doubles (-3). Nicole Gibbs, 21-year-old former Stanford star -- No. 94 in singles (-1), No. 837 in doubles (-2). Michaela Gordon, 15-year-old resident of Saratoga in San Francisco Bay Area -- No. 698 in singles (-1). Lejla Hodzic, 28-year-old former Stanford standout -- No. 731 in doubles (-4). Raquel Kops-Jones, 31-year-old San Jose resident and former Cal star -- No. 12 in doubles (no change), No. 813 in singles (-3). Maria Sanchez, 24-year-old Modesto product -- No. 80 in doubles (no change), No. 241 in singles (-1). Karina Vyrlan, 16-year-old Sacramentan -- No. 773 in singles (+2). Allie Will, 23-year-old native of San Mateo in San Francisco Bay Area -- No. 161 in doubles (-1), No. 546 in singles (+5). Carol Zhao, 19-year-old Stanford sophomore -- No. 296 in singles (-3), No. 518 in doubles (no change). Davis Cup final, Switzerland at France, 5-11 a.m. (live), 11:30 a.m.-2:30 p.m. and 5-11 p.m. (repeat). Davis Cup final, Switzerland at France, 6:30-9:30 a.m. (live), 11 a.m.-2 p.m., 5-8 p.m. and 8:30-11:30 p.m. (repeat). Davis Cup final, Switzerland at France, 4-10 a.m. (live), 11 a.m.-2 p.m. and 5-11 p.m. (repeat). Stacy Margolin Potter and Bob Meyers. 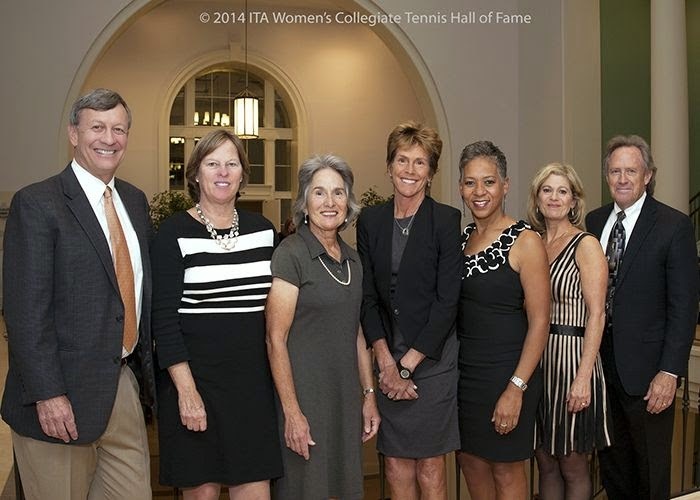 Cecilia Martinez, a former college and pro standout and women's tennis pioneer from Northern California, was inducted in the ITA Women's Collegiate Tennis Hall of Fame with five others on Monday in Williamsburg, Va.
Martinez, the 1966 intercollegiate champion from San Francisco State, reached No. 4 in the world in doubles and No. 15 in singles. At the 1970 U.S. Open, Martinez and doubles partner Esme Emanuel handed out a questionnaire asking tennis fans whether they would support a women's tour and collected nearly 300 responses. Half of the men and two-thirds of the women said they would pay to attend a women's tournament. --Katrina Adams, the 1987 NCAA doubles champion (with Diane Donnelly) from Northwestern. Adams climbed to No. 8 in the world in doubles, winning 20 titles. A commentator for Tennis Channel since 2003, she will become the chairman of the board, CEO and president of the USTA in January. --Stacy Margolin Potter, who won the National Collegiate Singles Championship while at USC in 1977 and helped the Women of Troy capture the 1978 team title. As a pro, she reached a career-high No. 18 in singles. --Bob Meyers, who launched the Southern Illinois-Edwardsville women's team in 1979 and coached the Cougars to four straight NCAA Divison II championships, three NCAA singles titles and two NCAA doubles crowns. --Jeff Moore, who coached the University of Texas women for 23 years (1982-2005). Under Moore, the Longhorns captured the NCAA team title in 1993 and 1995, had two runner-up finishes and appeared in three other Final Fours. --Lindsay Morse Bennett, a former UC Irvine star who won the 1977 singles title at the Women's National Collegiate Championships. Bob and Mike Bryan almost were eliminated early in the Barclays ATP World Tour Finals in London. Today, though, the 36-year-old identical twins hoisted their fourth trophy in the season-ending tournament featuring the top eight doubles teams of the year. The top-seeded Bryans, originally from Camarillo in the Los Angeles area, edged seventh-seeded Ivan Dodig of Croatia and Marcelo Melo of Brazil 6-7 (5), 6-2 [10-7] for their 10th title of the year and 103rd of their career. After losing their opening round-robin match, the Bryans edged fifth-seeded Jean-Julien Rojer of the Netherlands and Horia Tecau of Romania 6-7 (4), 6-3 [10-6]. The Bryans had trailed 3-1 in the second set and 4-0 in the match tiebreaker against Rojer and Tecau. A loss would have meant an ignominious exit for the holders of a record 16 Grand Slam men's doubles titles. The former NCAA doubles champions from Stanford won one major this year, the U.S. Open for their 100th career title. “Looking back at the year, we're very proud of the way it went,” Mike Bryan said on atpworldtour.com. “If we had to pick one highlight during this great season, it would probably have to be the U.S. Open. It was just a milestone we were shooting for. "One of our big goals coming in the year was to try to hit 100 titles. We did it luckily at our home Grand Slam when there was a lot of talk about it. To finish year-end No. 1 was a huge goal; we did that for the 10th season. That ranks right up there. The Bryans won the ATP Finals for the first time since 2009. They also triumphed in 2003 and 2004 and were the runners-up in 2008 (to Daniel Nestor of Canada and Nenad Zimonjic of Serbia) and last year (to Spaniards David Marrero and Fernando Verdasco). Dodig and Melo were the only team in the field that did not win a title this year. Bob and Mike Bryan will play for their fourth ATP World Tour Finals title. The top seeds and former Stanford stars overwhelmed fourth-seeded Julien Benneteau and Edouard Roger-Vasselin 6-0, 6-3 in 53 minutes today in London. The Bryans improved to 4-0 against the Frenchmen. The 36-year-old Bryan twins will meet seventh-seeded Ivan Dodig of Croatia and Marcelo Melo of Brazil today for the title. Dodig and Melo, the only team in the ATP World Tour Finals not to have won a title this year, edged eighth-seeded Lukasz Kubot of Poland and Robert Lindstedt of Sweden 4-6, 6-4 [10-6]. The finalists have met once this year. The Bryans prevailed 6-3, 3-6 [10-8] on clay in Monte Carlo in April for one of their nine titles this year. The Bryans also beat Dodig and Melo 3-6, 6-3, 6-4, 6-4 in 2013 for the last of their three Wimbledon crowns. The Bryans won the ATP Finals in 2003, 2004 and 2009. They were the runners-up in 2008 to Daniel Nestor of Canada and Nenad Zimonjic of Serbia and last year to Spaniards David Marrero and Fernando Verdasco. Top-seeded Bob and Mike Bryan of the United States reached the semifinals of the Barclay's ATP World Tour Finals in London, edging third-seeded Alexander Peya of Austria and Bruno Soares of Brazil 7-6 (3), 7-6 (2) on Friday. The Bryans, 36-year-old identical twins and former NCAA doubles champions from Stanford, will meet fourth-seeded Julien Benneteau and Edouard Roger-Vasselin of France today. Both teams won one Grand Slam men's doubles title this year, the Bryans at the U.S. Open and Benneteau and Roger-Vasselin at the French Open. Overall, the Bryans have won a record 16 majors and Benneteau and Roger-Vasselin one. In the other semifinal, seventh-seeded Ivan Dodig of Croatia and Marcelo Melo of Brazil will face eighth-seeded Lukasz Kubot of Poland and Robert Lindstedt of Sweden. The Bryans seek their fourth ATP Finals title after winning in 2003, 2004 and 2009. They were the runners-up in 2008 to Daniel Nestor of Canada and Nenad Zimonjic of Serbia and last year to Spaniards David Marrero and Fernando Verdasco. Deepal Wannakuwatte, the former owner of the defunct Sacramento Capitals in World TeamTennis, was sentenced to 20 years in prison on Thursday in Sacramento for orchestrating a massive Ponzi scheme. The Sacramento Bee reported that Wannakuwatte, a native of Sri Lanka who will turn 64 next week, will be eligible for parole in 17 years. U.S. District Judge Troy Nunley called Wannakuwatte "an evil person" at the sentencing, according to The Bee. One victim who lost $22 million went further, referring to Wannakuwatte as a "sociopath," "serial liar" and "serial thief." In a letter read by defense attorney Philip Cozens, Wannakuwatte apologized to his victims and asked forgiveness. The league played its 39th season in July with seven teams instead of eight. Top-seeded Bob and Mike Bryan twice were in serious danger today of early elimination from the Barclay's ATP World Tour Finals in London. But the 36-year-old identical twins and former Stanford All-Americans showed the mental toughness that has helped carry them to a record 16 Grand Slam men's doubles titles. The Bryans pulled out a 6-7 (4), 6-3 [10-6] round-robin victory over fifth-seeded Jean-Julien Rojer of the Netherlands and Horia Tecau of Romania. The Bryans trailed 3-1 in the second set and 4-0 in the match tiebreaker. But they improved to 4-0 against Rojer and Tecau, who have won eight titles in their first season as a team. Now 1-1 in the tournament, the Bryans will play their last round-robin match on Friday against third-seeded Alexander Peya of Austria and Bruno Soares of Brazil. The Bryans are trying to win the season-ending tournament for the fourth time and earn their 10th title of the year. Collin Altamirano, 18-year-old Sacramentan -- Career-high No. 732 in singles (+1), career-high No. 865 in doubles (+2). Bradley Klahn, 24-year-old former Stanford star -- No. 136 in singles (-16), No. 154 in doubles (no change). Mackenzie McDonald, 19-year-old Piedmont resident -- No. 632 in singles (-4), No. 580 in doubles (-2). Dennis Novikov, 21-year-old San Jose resident -- Career-high No. 366 in singles (+4), No. 461 in doubles (-4). Sam Querrey, 27-year-old San Francisco native and former Sacramento Capital in World TeamTennis (2012-13) -- No. 34 in singles (no change), No. 64 in doubles (-1). Matt Seeberger, 30-year-old Los Altos resident -- Career-high No. 502 in doubles (no change). Dmitry Tursunov, 31-year-old resident of Folsom in Sacramento area -- No. 109 in singles (-1), No. 175 in doubles (+3). Kristie Ahn, 22-year-old former Stanford star -- No. 649 in singles (+1), No. 714 in doubles (-3). CiCi Bellis, 15-year-old resident of Atherton in San Francisco Bay Area -- Career-high No. 257 in singles (no change), career-high No. 823 in doubles (+23). Hadley Berg, 18-year-old resident of Greenbrae in San Francisco Bay Area -- No. 948 in doubles (-1). Alexandra Facey, 21-year-old resident of Cameron Park in Sacramento area -- No. 735 in doubles (+2). Kat Facey, 21-year-old resident of Cameron Park in Sacramento area -- No. 735 in doubles (+2). Nicole Gibbs, 21-year-old former Stanford star -- No. 93 in singles (-1), No. 835 in doubles (-7). Michaela Gordon, 15-year-old resident of Saratoga in San Francisco Bay Area -- Career-high No. 697 in singles (+3). Lejla Hodzic, 28-year-old former Stanford standout -- Career-high No. 727 in doubles (+1). Raquel Kops-Jones, 31-year-old San Jose resident and former Cal star -- No. 12 in doubles (no change), No. 810 in singles (+2). Maria Sanchez, 24-year-old Modesto product -- No. 80 in doubles (-1), No. 240 in singles (-14). Karina Vyrlan, 16-year-old Sacramentan -- No. 775 in singles (+2). Allie Will, 23-year-old native of San Mateo in San Francisco Bay Area -- No. 160 in doubles (-10), No. 551 in singles (-46). Carol Zhao, 19-year-old Stanford sophomore -- No. 293 in singles (+6), No. 518 in doubles (+5). ATP World Tour Finals in London, round-robin doubles, 4-6 a.m. (live), 8-10 a.m. (repeat), 10 a.m.-noon (live). ATP World Tour Finals in London, round-robin singles, 6-8 a.m. and noon-2 p.m. (live). ATP World Tour Finals in London, round robin, 2:30 p.m.-1 a.m. Thursday (repeat). ATP World Tour Finals in London, round robin, 2:30 p.m.-1 a.m. Friday (repeat). ATP World Tour Finals in London, round-robin doubles, 4-6 a.m. (live), 8-9:45 a.m. (repeat), 9:45-11:30 a.m. (live). ATP World Tour Finals in London, round-robin singles, 6-8 a.m. (live). ATP World Tour Finals in London, round-robin singles, ESPN2, noon-2 p.m. (live). ATP World Tour Finals in London, round robin, 2:30 p.m.-1 a.m. Saturday (repeat). ATP World Tour Finals in London, doubles semifinals, 4-6 a.m. (live), 8-10 a.m. (repeat), 10 a.m.-noon (live). ATP World Tour Finals in London, singles semifinals, 6-8 a.m. (live). ATP World Tour Finals in London, singles semifinals, ESPN2, noon-2 p.m. (live). ATP World Tour Finals in London, round robin, 2:30 p.m.-1 a.m. Sunday (repeat). ATP World Tour Finals in London, doubles final, 7:30-9:30 a.m. (live). ATP World Tour Finals in London, singles final, ESPN2, 10 a.m.-noon (live). ATP World Tour Finals in London, singles final, 5-9 p.m. (repeat). Eighth-seeded Lukasz Kubot and Robert Lindstedt stunned top seeds and three-time champions Bob and Mike Bryan 7-6 (3), 6-3 today in a round-robin opener at the Barclay's ATP World Tour Finals in London. Kubot and Lindstedt saved one set point at 5-6 on Kubot's serve in the first set of the tournament featuring the top eight singles players and top eight doubles teams of the year. Three of the four players in the doubles match attended college in Northern California. The Bryan twins led Stanford to the 1997 and 1998 NCAA team titles in their two years on the Farm. Bob Bryan won a rare Triple Crown in 1998, also prevailing in singles and doubles (with Mike). Lindstedt, a 37-year-old Swede, played at Fresno State before transferring to Pepperdine and reaching the 1998 NCAA doubles final. In that match, Lindstedt and Kelly Gullett lost to none other than the Bryans. The 36-year-old Bryans have captured a record 16 Grand Slam men's doubles titles, including this year's U.S. Open. They won the ATP World Tour Finals in 2003, 2004 and 2009 and were the runners-up in 2008 and last year (to Spaniards David Marrero and Fernando Verdasco). Kubot, from Poland, and Lindstedt won the Australian Open in January for the first Grand Slam title for either player. For the second time this year, a Cal woman lost to a University of Virginia player in a national final. Sixth-seeded Julia Elbaba of Virginia beat unseeded Maegan Manasse of Cal 6-2, 7-5 today to win the USTA/ITA National Indoor Intercollegiate Championship in Flushing Meadows, N.Y. 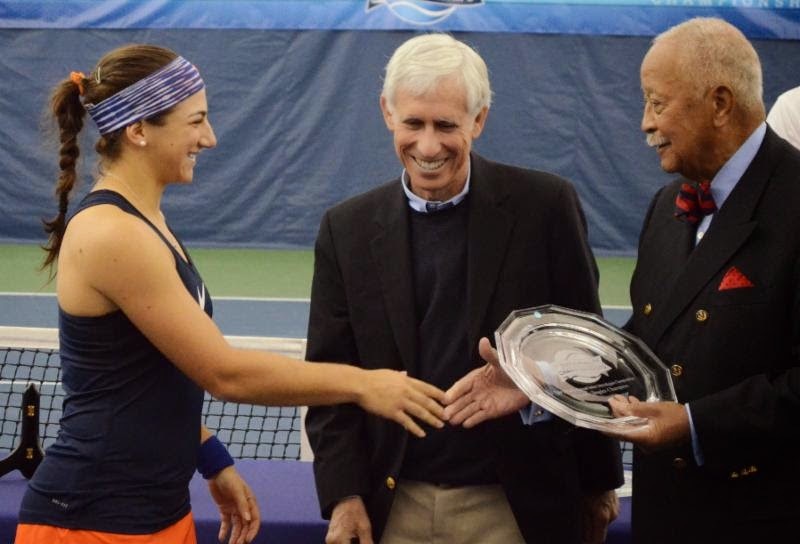 In May, the Cavaliers' Danielle Collins defeated the Bears' Lynn Chi for the NCAA title. Elbaba, a junior from Oyster Bay, N.Y., is ranked fifth nationally. Manasse, a sophomore from Redondo Beach in the Los Angeles area, is 43rd. Elbaba eliminated Cal's Zsofi Susanyi, an NCAA semifinalist as a freshman in 2012, 6-2, 6-4 in the first round and top-seeded and top-ranked Jamie Loeb of North Carolina 7-6 (4), 4-6, 6-2 in the quarterfinals. Manasse had not faced a seed in the tournament at the USTA Billie Jean King National Tennis Center, the home of the U.S. Open. --Brayden Schnur of North Carolina defeated Gonzales Austin of Vanderbilt 6-4, 7-6 (2) in men's singles. Both players were unseeded. --Top-seeded Yannick Hanfmann and Roberto Quiroz of reigning NCAA champion USC outplayed unseeded Ross Guignon and Tim Kopinsky of Illinois 6-3, 7-5 in men's doubles. --Unseeded Catherine Harrison and Kyle McPhillips of NCAA champion UCLA upset second-seeded Pleun Burgmans and Emily Flickinger of Auburn 6-2, 6-3 in women's doubles. Fifth-seeded Maegan Manasse of Cal topped unseeded Stephanie Wagner of Miami 6-3, 7-6 (4) today to reach the final of the USTA/ITA National Indoor Intercollegiate Championship in Flushing Meadows, N.Y.
Manasse, a sophomore from Redondo Beach in the Los Angeles area, has not lost a set in her four matches. All have been against unseeded players. Wagner, ranked 18th, dispatched second-seeded Chanelle Van Nguyen of NCAA champion UCLA 6-2, 6-2 in the second round and NCAA singles runner-up Lynn Chi of Cal 6-1, 6-3 in the quarterfinals. Manasse will play sixth-seeded Julia Elbaba of Virginia in Sunday's final at the USTA Billie Jean King National Tennis Center, the home of the U.S. Open. Elbaba is ranked fifth and Manasse 43rd. Elbaba, a junior from Oyster Bay, N.Y., outplayed fourth-seeded Brooke Austin of Florida 6-2, 6-4. In the men's final, Brayden Schnur of North Carolina will face Gonzales Austin of Vanderbilt. Both players are unseeded, but Schnur is ranked seventh and Austin ninth. UCLA's Mackenzie McDonald, a sophomore from Piedmont in the San Francisco Bay Area, and Martin Redlicki lost to Ross Guignon and Tim Kopinski of Illinois 6-3, 3-6 [10-7] in a battle of unseeded teams in the doubles semifinals. Fifth-seeded Maegan Manasse of Cal won two matches Friday to reach the semifinals of the USTA/ITA National Indoor Intercollegiate Championship at the USTA Billie Jean King National Tennis Center in Flushing Meadows, N.Y.
Manasse, a sophomore from Redondo Beach in the Los Angeles area, beat Despoina Vogasari of Houston 6-4, 6-4 in the second round and Stephanie Nauta of Virginia 6-2, 6-3 in the quarterfinals. Manasse, who has not lost a set in her three matches, will face unseeded Stephanie Wagner of Miami today at 7:30 a.m. PST. Wagner ousted Lynn Chi of Cal 6-1, 6-3 in a matchup of unseeded players. Earlier Friday, Chi avenged her loss to Danielle Collins of Virginia in this year's NCAA final with a 3-6, 6-3, 6-1 victory over the No. 7 seed. In today's other women's semifinal, fourth-seeded Brooke Austin of Florida will meet sixth-seeded Julia Elbaba of Virginia. All men's semifinalists are unseeded. Ryan Shane of Virginia will take on Gonzales Austin of Vanderbilt, and Brayden Schnur of North Carolina will play Dominik Koepfer of Tulane. Mackenzie McDonald, a UCLA sophomore from Piedmont in the San Francisco Bay Area, and Martin Redlicki advanced to the men's doubles semifinals with a 7-5, 6-4 victory over Alex Lawson and Billy Pecor of Notre Dame. Third-seeded Klara Fabikova and Zsofi Susanyi of Cal lost to unseededCatherine Harrison and Kyle McPhillips of NCAA champion UCLA 6-4, 6-4 in the women's doubles quarterfinals. at the USTA Billie Jean King National Tennis Center in Flushing Meadows, N.Y.
Daily tickets and daily double packages for the BNP Paribas Open are now on sale, tournament director Steve Simon announced this week. The BNP Paribas Open, the largest WTA and ATP World Tour combined two-week event in the world, is scheduled for March 9-22, 2015, at the Indian Wells Tennis Garden. Daily loge and grandstand tickets for Stadium 1 range in price from $15 for a grandstand seat for the first Thursday evening session to $67 and $105 for grandstand and loge seats, respectively, for championship weekend. The daily double package provides the same seat (suite, box or loge) for both day and evening sessions. New this year, fans can get seats right behind the front box seats by purchasing a premium courtside daily double BNP Paribas Open tennis package. Local residents, students, seniors, military and USTA members can receive 30 percent off on loge seats in Stadium 1 between March 11 and 19, 2015. BNP Paribas Open daily tickets for reserved seats in Stadium 2 in the lower bowl, including 100 sections and select 200 sections, begin at $130. Access to some 200 sections in the lower bowl and to all sections in the upper bowl is on a general admission basis and available to any patron holding a ticket to the tournament. Also, any ticket to the BNP Paribas Open provides access to the general admission sections of Stadiums 1-9 for day sessions. Classic series, mini, group and hotel packages are still available as well. Improvements at the Indian Wells Tennis Garden include eight new (9 feet x 5 feet) video screens inside Stadium 1 and new hydration stations on the loge level. Stadium 2 will have new shade awnings added to the restaurant patio areas and the Point Bar, along with a designated reservation check-in area for all three restaurants with seating and television screens to watch the matches and a new bar. Also, seating also is being added throughout the venue, including Practice Courts 15-20. In all, 3,625 seats will be added, with 45,110 seats being available for a session at the 2015 BNP Paribas Open. Lastly, new video boards will be placed near all practice courts to make it easier than ever for fans to identify the players on court. Amerigo Contini of Virginia Tech stunned third-seeded Mackenzie McDonald, a UCLA sophomore from Piedmont in the San Francisco Bay Area, 6-3, 1-6, 6-4 on Thursday in the first round of the USTA/ITA National Indoor Intercollegiate Championship in Flushing Meadows, N.Y. The tournament is being held at the Billie Jean King National Tennis Center, the site of the U.S. Open. Also, Thai Kwiatkowski of Virginia defeated Stanford freshman Thomas Fawcett 7-5, 6-3. Two Cal women advanced, both in straight sets. Fifth-seeded Maegan Manasse crushed Josie Kuhlman of Florida 6-0, 6-1, and Lynn Chi dispatched Valentine Confalonier of Lynn 6-3, 6-4. Chi will have a chance to avenge her loss to seventh-seeded Danielle Collins of Virginia in the NCAA final last May. Collins held off Sydney Campbell of Vanderbilt 6-2, 5-7, 6-3. Sixth-seeded Julia Elbaba of Virginia beat Cal's Zsofi Susanyi 6-2, 6-4, and Caroline Price of North Carolina eliminated Giuliana Olmos, a USC junior from Fremont in the Bay Area, 7-5, 6-1. Advancing to the doubles quarterfinals were McDonald and Martin Redlicki on the men's side and third-seeded Klara Fabikova and Susanyi on the women's. Fourth-seeded Manasse and Denise Starr lost to Kelsey Laurente and Viktoriya Lushkova of Oklahoma State 6-4, 3-6 [10-5]. Bernardo Saraiva and Nils Skajaa of USF fell to Kevin Metka and Ralf Steinbach of Ohio State 6-2, 6-4. Fed Cup final, Germany at Czech Republic, 4-8 a.m. (live), 9:30 a.m.-1:30 p.m. (repeat). ATP World Tour Finals in London, round robin, 2:30 p.m.-1 a.m. Monday (repeat). ATP World Tour Finals in London, round robin, 2:30 p.m.-1 a.m. Tuesday (repeat). ATP World Tour Finals in London, round robin, 2:30 p.m.-1 a.m. Wednesday (repeat). Collin Altamirano, 18-year-old Sacramentan -- Career-high No. 733 in singles (no change), career-high No. 867 in doubles (+7). Bradley Klahn, 24-year-old former Stanford star -- No. 120 in singles (+4), No. 154 in doubles (-11). Mackenzie McDonald, 19-year-old Piedmont resident -- No. 628 in singles (-2), No. 578 in doubles (-1). Dennis Novikov, 20-year-old San Jose resident -- Career-high No. 370 in singles (+41), career-high No. 457 in doubles (+2). Sam Querrey, 27-year-old San Francisco native and former Sacramento Capital in World TeamTennis (2012-13) -- No. 34 in singles (+4), No. 63 in doubles (+1). Matt Seeberger, 30-year-old Los Altos resident -- Career-high No. 502 in doubles (-23). Dmitry Tursunov, 31-year-old resident of Folsom in Sacramento area -- No. 108 in singles (-1), No. 178 in doubles (-1). Kristie Ahn, 22-year-old former Stanford star -- No. 650 in singles (+62), No. 711 in doubles (+21). CiCi Bellis, 15-year-old resident of Atherton in San Francisco Bay Area -- Career-high No. 257 in singles (no change), career-high No. 846 in doubles (+18). Hadley Berg, 18-year-old resident of Greenbrae in San Francisco Bay Area -- No. 947 in doubles (+17). Alexandra Facey, 21-year-old resident of Cameron Park in Sacramento area -- No. 737 in doubles (+21). Kat Facey, 21-year-old resident of Cameron Park in Sacramento area -- No. 737 in doubles (+21). Nicole Gibbs, 21-year-old former Stanford star -- No. 92 in singles (no change), No. 828 in doubles (-240). Michaela Gordon, 15-year-old resident of Saratoga in San Francisco Bay Area -- Career-high No. 700 in singles (+13). Lejla Hodzic, 28-year-old former Stanford standout -- Career-high No. 728 in doubles (+20). Raquel Kops-Jones, 31-year-old San Jose resident and former Cal star -- No. 12 in doubles (no change), No. 812 in singles (+19). Maria Sanchez, 24-year-old Modesto product -- Career-high No. 79 in doubles (no change), No. 226 in singles (+32). Karina Vyrlan, 16-year-old Sacramentan -- No. 777 in singles (+26). Allie Will, 23-year-old San Mateo native -- No. 150 in doubles (no change), No. 505 in singles (-5). Carol Zhao, 19-year-old Stanford sophomore -- No. 299 in singles (-2), No. 523 in doubles (+8). Eve Zimmerman-Short has a legendary passion for tennis. As a player at the University of the Pacific in Stockton 30 years ago, she was so excited about the resurfaced courts that she kissed them. Zimmerman-Short, who lives in England with her husband and young son, returned to campus last month for the groundbreaking of the $3 million Eve Zimmerman Tennis Center. Completion is scheduled for the winter of 2015. Zimmerman-Short donated $1.5 million for the complex, which will feature 12 courts, a 5,500-square-foot clubhouse, covered player benches and a new electronic scoreboard. "This facility will enable Pacific tennis players to shine as Tigers should," Zimmerman, who played for Pacific from 1980 to 1984 and went on to compete professionally, said on pacifictigers.com. Ted Leland, vice president for external relations and athletics at Pacific, said the complex "will give Pacific tennis a critical recruiting edge with our peer NCAA and West Coast Conference institutions. It will enable the Tigers to take their game to a whole new level." It was a big day for former Stanford men's stars. Bob and Mike Bryan set another doubles record on Sunday, and Bradley Klahn won another Challenger singles title. The top-seeded Bryans became the first players in singles or doubles to win six Masters 1000 crowns on the ATP World Tour in one season, edging unseeded Marcin Matkowski of Poland and Jurgen Melzer of Austria 7-6 (5), 5-7 [10-6] in the BNP Paribas Masters in Paris. The 36-year-old identical twins also won titles at Indian Wells, Miami, Monte Carlo, Cincinnati and Shanghai, in addition to the U.S. Open and ATP 250 tournaments in Delray Beach and Houston. The Bryans have won 102 career ATP titles, including 32 Masters 1000s and four in the Paris indoors. Masters 1000s are the highest level in men's professional tennis other than the Grand Slams. The Bryans will try to win the season-ending Barclays ATP World Tour Finals, which begin Sunday in London, for the fourth time. The natives of Camarillo in the Los Angeles area led Stanford to NCAA team championships in their two years on the Farm, 1997 and 1998. Bob Bryan pulled off a rare Triple Crown as a sophomore, winning the NCAA singles and doubles crowns (with Mike) in addition to the team title. Matkowski and Melzer played together for the first time in Paris. The second-seeded Klahn won his third Challenger singles crown of the year and fifth overall, beating unseeded U.S. countryman Jarmere Jenkins 7-6 (5), 6-1 in the $50,000 Traralgon (Australia) Challenger. Klahn, a 24-year-old left-hander from Poway in the San Diego area, underwent surgery for a herniated disc three years ago as a Stanford junior. He missed two months this spring when his back flared up and five weeks in the summer with a foot sprain. Jenkins, 23, of Coconut Creek, Fla., knocked off No. 1 seed Go Soeda of Japan, No. 4 Hiroki Moriya of Japan and No. 5 Thanasi Kokkinakis of Australia en route to the Traralgon final. Both Klahn and Jenkins are former NCAA champions with college degrees. Klahn won the 2010 singles title as a sophomore and graduated in economics in 2012. In 2013, Jenkins led Virginia to its first NCAA team championship, reached the singles final and won the doubles crown with Mac Styslinger. Jenkins earned an anthropology degree but could not attend commencement because it conflicted with the NCAA Tournament. 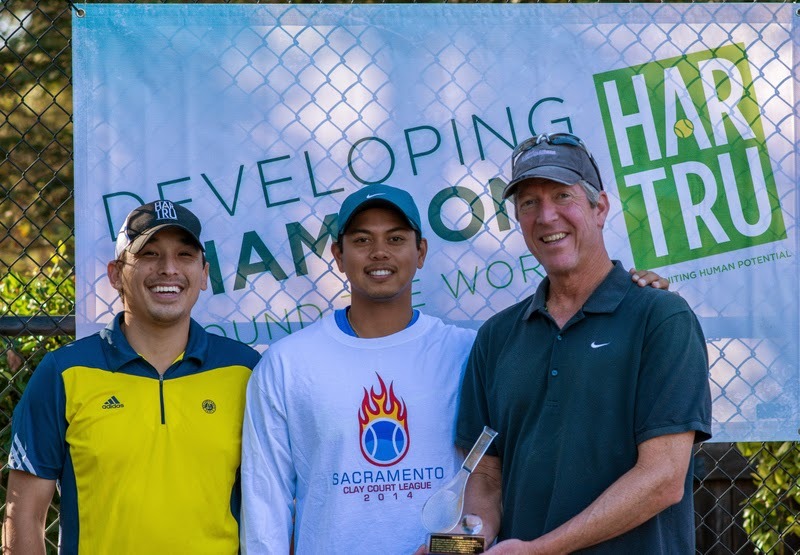 ORANGEVALE, Calif. -- Justin Garcia and Jeff Shin defeated Scott Colby and Whit Livingston 6-4, 6-4 on Sunday to win the open division of the Sacramento Clay Court League. Garcia and Shin, the runners-up last year, split $400 in the doubles-only league at the home of Ben and Mary Combs. Colby and Livingston shared $200. Bryan Paveglio and Steve Scurfield repeated in the 40-and-over division, outlasting Chris Gerety and Todd Stanley 7-5, 7-5. The champions divided $700 and the runners-up $300. Ben Combs and Mark Tappan won the 50-and-over title, holding off Bob Deller and Mike Smith 6-4, 7-6 (5) to collect $300 total. Deller and Smith split $100. The league began in 2007. The doubles team of Justin Garcia and Jeff Shin on Saturday reached the open final of the Sacramento Clay Court League for the second straight year. Garcia and Shin advanced by default over Eric Roberson and Yasmin Schnack in the losers' bracket of the doubles-only league at Ben and Mary Combs' house in the Sacramento suburb of Orangevale. Garcia and Shin will face Whit Livingston and Scott Colby today at 1 p.m. for the title. Livingston and Colby edged Roberson and Schnack 3-6, 6-3, 6-4 in the winners' bracket last Sunday. Play will begin today at 9:30 a.m., when Bryan Paveglio and Steve Scurfield defend their 40-and-over title against Chris Gerety and Todd Stanley. In the 50-and-over final at 11 a.m., Mike Smith and Bob Deller will oppose Ben Combs and Mark Tappan. Finalists in the three divisions will compete for a total of $2,000. The public is invited to attend the matches, including a barbecue lunch, at 8582 Westin Lane. Donations will benefit the Sacramento Community Tennis Association and its Sacramento Junior Tennis Fund, which provides lessons for underprivileged children. Roberson, a 28-year-old former Boise State standout from Sacramento, won last year's open title with Darrin Cohen, who did not return, and mixed doubles crown with Schnack. Mixed doubles was not offered this year. Roberson and Schnack, a 26-year-old resident of Elk Grove in the Sacramento area, won a national playoff last year to earn an automatic wild card in mixed doubles at the U.S. Open. They fell to Slovakians Janette Husarova and Filip Polasek 6-4, 7-6 (3) in the first round. Shin won the 2012 open title in the Sacramento Clay Court League with Kevin Vieira. For more information, click on sacramentoclaycourtleague.com.